Monday's Lunchtime Sketch Challenge ... on Sunday! Last weekend, on the Cape Retreat with my other demonstrator friends, my upline challenged us to participate weekly in Mary Jo Price's Sketch Challenge. I forgot about it until today ... that gets me in just under the wire since the sketch is released weekly on Mondays!! Close-up View of a part of the card. The base of my card is Marina Mist -- I have a small navy piece of card stock under the designer paper just to give it some stability. 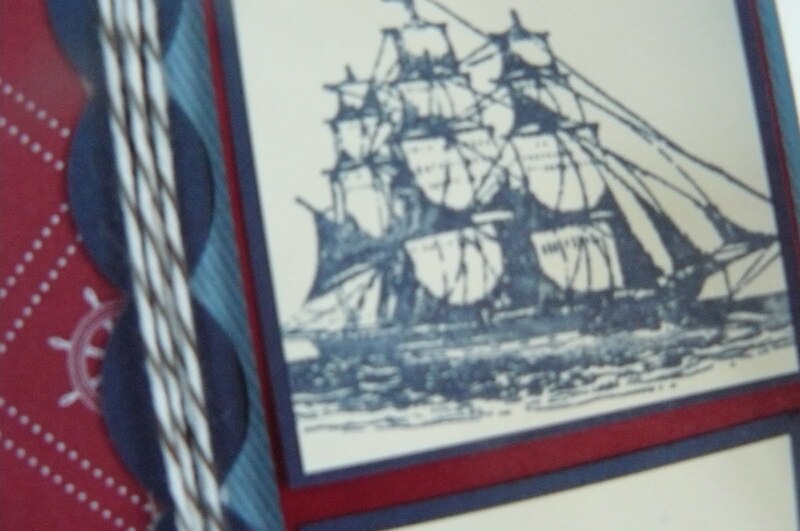 The scallop on the side of the images is from the Tasteful Trim die. I wrapped some Early Espresso Baker's Twine (I'm thinking hemp would have worked really well here too but it was upstairs and I'm downstairs!) around the trim. Lastly, the sentiment is from the Loving Thoughts stamp set -- that set could potentially retire on Monday with the end of the Mini Catalog!! Oh yes, and the Open Sea stamp set was carried over from last year's catalog -- you can still get that set if you need a fabulous go-to, manly set!! Don't forget to check out what other stamper's have made with this sketch with the blog hop! What a super-gorgeous day here in my small little suburb north of Boston! Lovin' this weather! 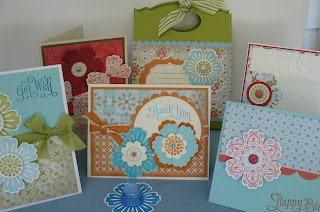 Last night I had my Summer Smooches card class -- I have to say, there are not enough days in the week, or weeks in the year to promote all of the wonderful stamp sets available in the Spring Mini Catalog that retires next Monday, or the stamp sets in the giant Idea Book and Catalog that finishes up on May 31st! Couple that up with the Retired Accessories list that was just released today and I'm full of anticipation for the new catalog that I'll get a sneak peek of on May 7th! 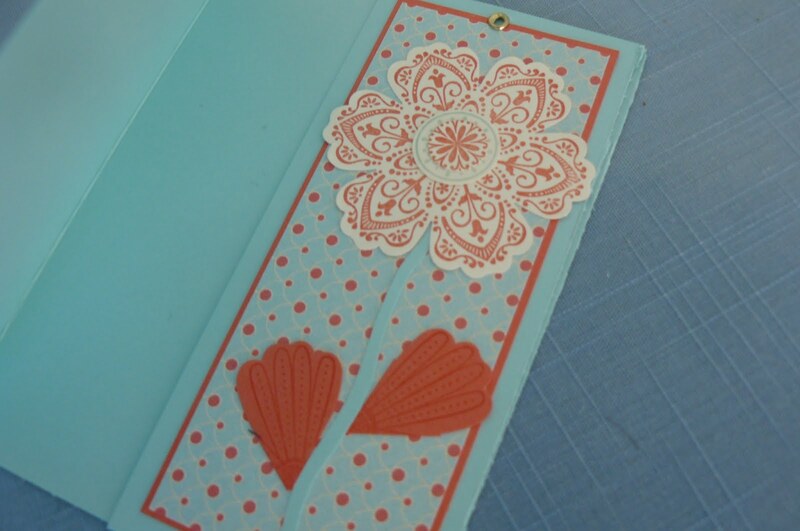 I had a lot of help in designing this card set -- the back right card was totally inspired by Chris Smith (From My Ink Pad to Yours) -- I just changed the indigo ribbon to Calypso Coral. 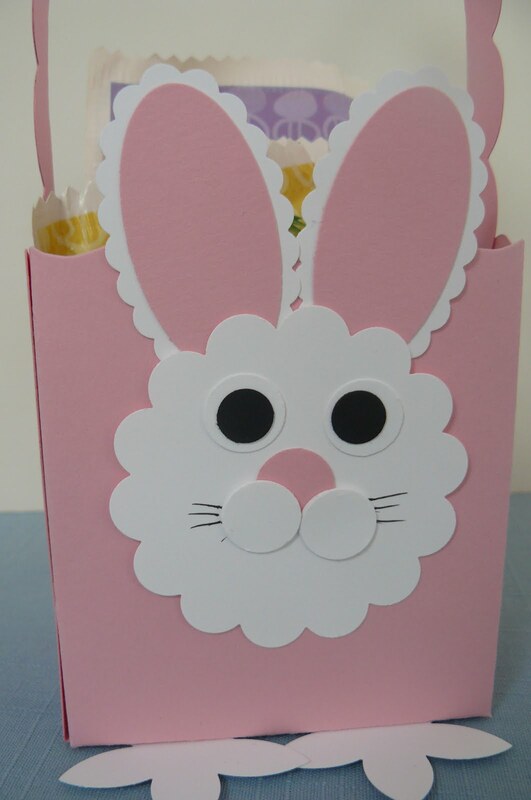 Other cards were inspired by swaps that my upline received in a group swap she participated in. I changed a few things here and there, but many of these cards might look familiar to demonstrators out there! I thank everyone for the creativity -- without their input, I don't know that I'd know where to start! I don't have individual photos, but if you're interested in making these cards, I've made a few kits up as well! Contact me and you're welcome to come to Open Stamping sessions to re-create these beauties!! On a somewhat sad note, the Retiring Accessories list is out and quite comprehensive! Click on this link to see the whole list (minus the craft scissors and paper snips which were included in error!). Then, email me or place an order through my website to get what you want before it's gone!! You have until the end of May to order retiring stamps -- that list can be seen here! Don't forget that the Simply Adorned jewelry line and the Decor Elements will be completely discontinued! 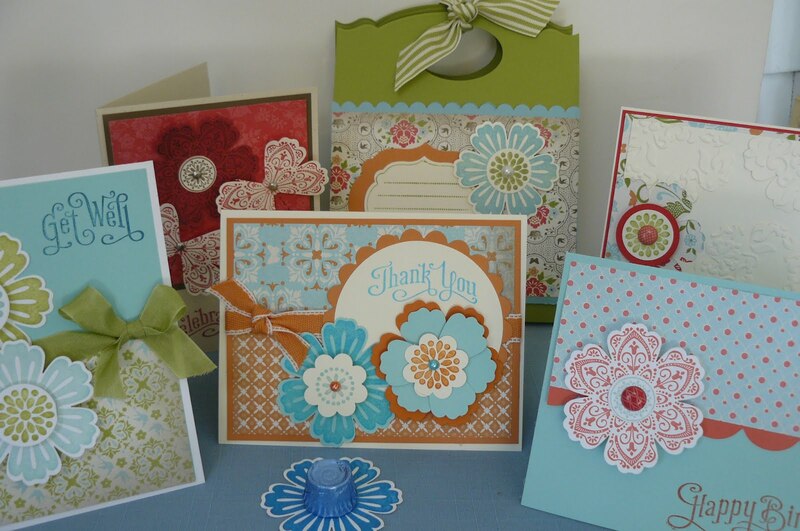 Tuesday night is my Mixed Bunch card class. I've wanted to do a class with this set since it came out but there's only been so much time with Easter, St. Patrick's Day, my work schedule, etc.! Well, Tuesday night is the night!! 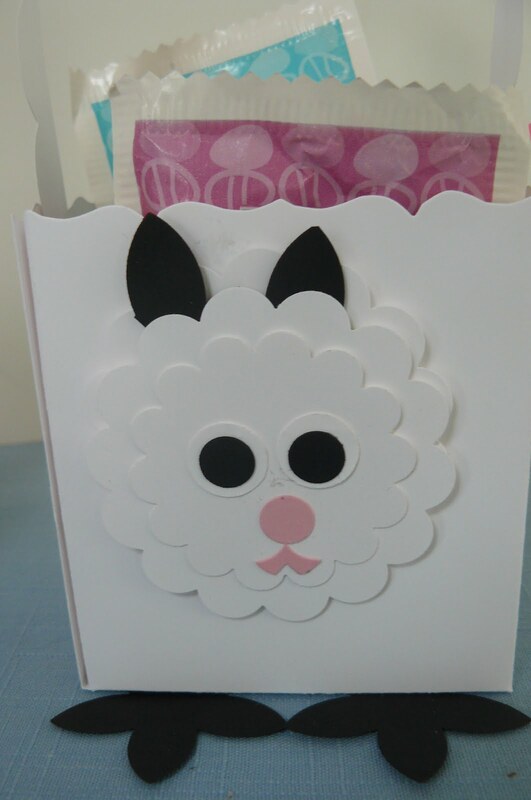 We're going to make a great box to hold the cards -- I found the directions for the pattern from Jill Hilliard's site, I believe. 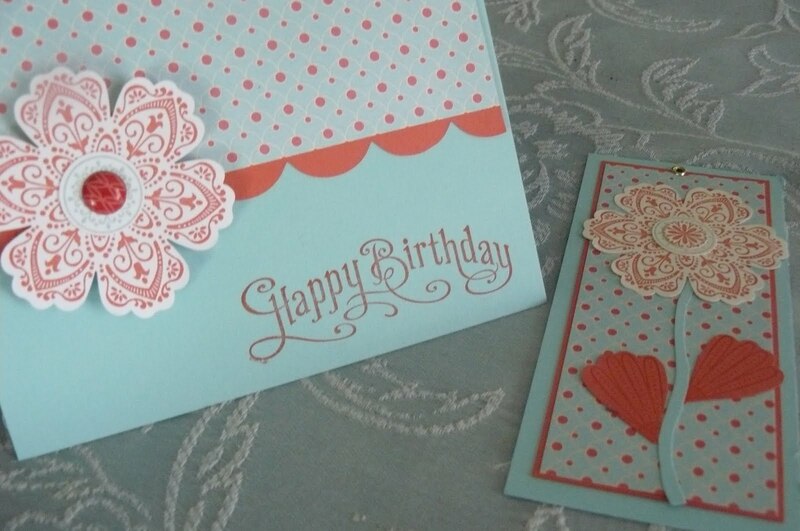 Then, we'll make 5 full-size cards -- all using the Everyday Enchantment DSP that was available during Sale-a-bration. Luckily that's something that I stocked up on! Love that paper!!! 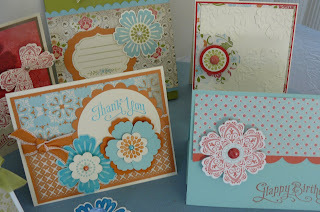 The back card on the right is case'd from Becky Roberts and Inking Idaho! I didn't really change a thing except to make my base Very Vanilla instead of the Poppy Parade (which I still used to mat). Here's a slightly different and closer view. 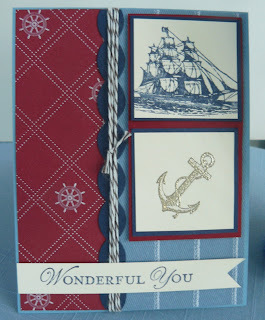 I wasn't a fan of the Poly-stitched ribbon until I put it with this paper!! Now that it's retiring, I can't get enough of it!! 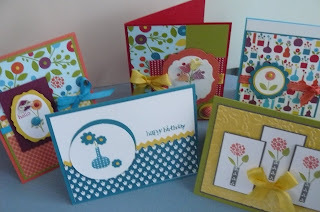 This is still another view -- used a lot of Pool Party on these cards! Luckily that color is around for another year!! The seam binding is Pear Pizzazz! I sure hope I like the next green as much as I've liked this color!! It seems fresher than Certainly Celery -- I'll survive with the Certainly Celery though!! Oops! I did such a great job perforating that it (the bookmark) detached already! Adorable, eh?! It just needs some ribbon to finish it off! 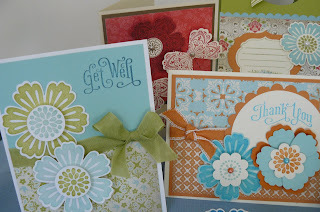 I used my perforating tool from Stampin' Up! to make the perforation edge. I bet many of us didn't even know it existed -- I think it might have been my first time using this tool, especially in a class! So, if you live in the Boston area, come Tuesday night at 7 pm.! I'll give you directions if you haven't been here before. Just leave me a comment or email me! Cost of the class is $25 and includes the 5 cards, all paper cut and scored, the box, the envelopes, and the 3D item. RSVP if you plan to come!! Oh yes, and if you'd like a kit, you can purchase that for the same price plus $4.95 shipping and handling -- email me and I'll send you a Paypal invoice for the kit. Hi all! I have two more favor boxes to share you after last week's Easter 3D class. If you look back to the post here, you'll see Darla Duck. Isn't she adorable?! Well, my friend Susan came to my open stamping session Tuesday night and I left her with the "assignment" of creating Lulu Lamb and Bella Bunny. She did great!! Check them out!! Here's two close-up views of the boxes. I was confused as to how Susan made the cute little mouth on Lulu -- if you can picture it, she used a scrap of the pink that she had just punched out with a scallop round punch, then trimmed it into the cute little pucker! We tried to add eyelashes, like Darla sported, but unfortunately, she (Lulu) looked slightly possessed! Not appropriate for this adorable pal!! 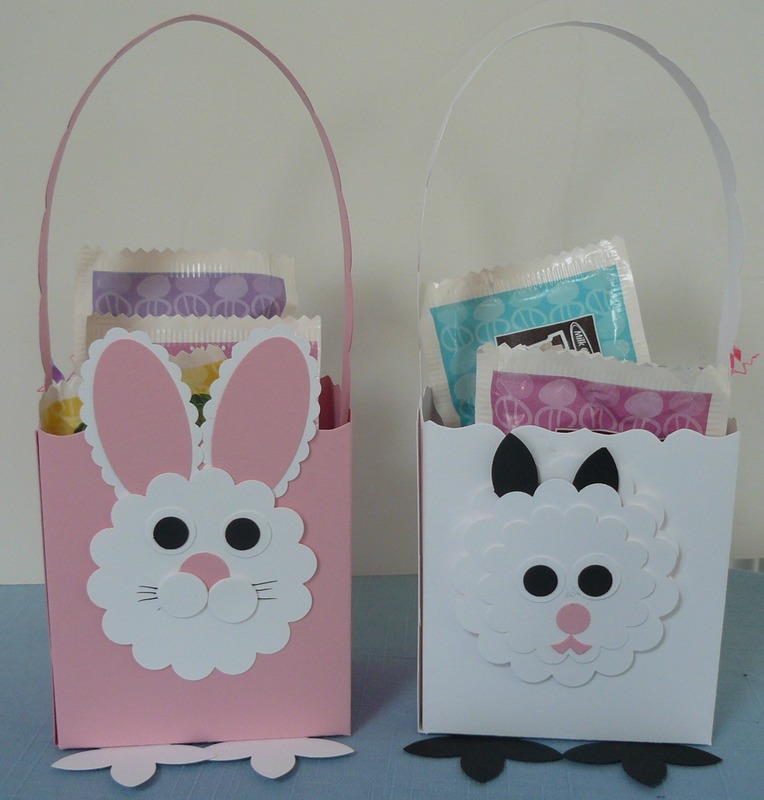 The handles on each basket are from the Tasteful Trim die. I'm off to our church's Passion Play tonight (Good Friday). They do a wonderful re-enactment of how the different "players" in Jesus's life felt after the fact of the crucifixion. Happy Easter to all! May God bless you with the promise of His Resurrection!